Just to post a recap of the things that have happened during the last year. While it has been awfully quiet around here a lot of things have been going on behind the screens and in other places. We did most of our data work within Hack de Overheid / Open State where we believe our efforts produced the largest possible impact. During the past two years as part of my program direction, curation, advice and advocacy along with the help of my extremely capable fellows has enabled a series of events and a network to evolve in the Netherlands, the likes of which the world has not yet seen. A summary would already be too long to post here (just skim the weeknotes to get a glimpse), but to name some highlights: several app competitions, numerous hackathons (the next of which is in Rotterdam) with apps developed in the hundreds and a range of theme networks around certain subjects. We have turned the Netherlands from an open data laggard into a country with one of the most vibrant ecosystems in Europe. Doing this together taught me one of the most important lessons in doing business: people working together can achieve more than they can alone. To add to that, the foundation we built is going to be even stronger in 2013 which will alleviate my personal involvement in the operational day-to-day and enable me to focus on my own data business again. On the services part, we have diversified from a pure visualization offering to a set of services that emphasize product development in a big data context as well as taking on teaching to develop data capabilities within organizations. We focus on Analysis, Creation and Teaching because we have found that a pure focus on visualization is not pertinent to solve significant problems for most organizations. 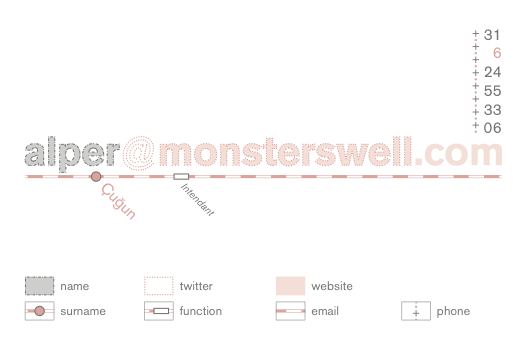 The issues they deal with are far more complex and capable visualizations are only one small part of the solution. Added to that we found that data literacy at all levels in society from decision makers to journalists and designers to the general public is severely lacking. This creates a challenging environment for those busy in the field of data. Explaining the work they do to the general public is not only in a practitioner’s self-interest, it is also a moral responsibility. Also we moved our base of operations to the European startup capital Berlin while still maintaining offices in the Netherlands. 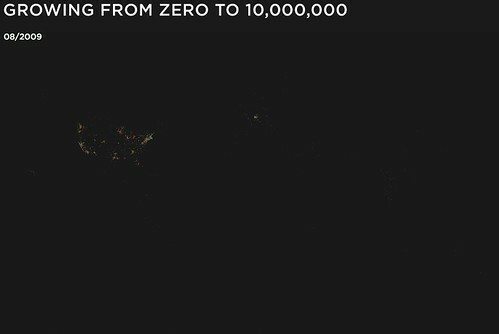 Somebody brought to my attention again the Foursquare user adoption animation they created in honour of their 10 millionth member. A great achievement for Foursquare and just the beginning of many more awesome things I am sure. In the animation, if you look at the still at August of 2009, you see the US gaining some traction and this flare across the pond. 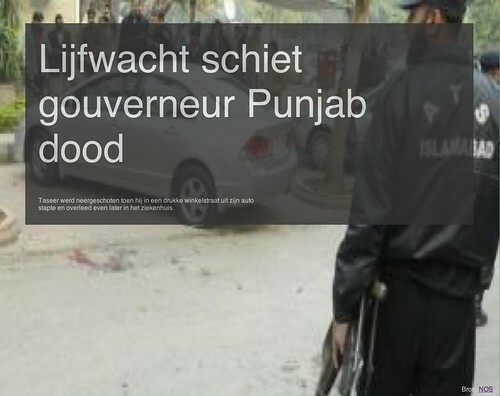 That is Amsterdam where at the time Foursquare was being adopted hand over fist. The story behind that is somewhat interesting and has been told, but this graphic does make it poignant again. Having visited SxSWi that last March, Robert Gaal and myself saw the launch of Foursquare and quickly got hooked. That was the year that location had not been played out yet at all, Latitude was fresh, Fire Eagle was still relevant and Brightkite was being used. Location was on the cusp. Back in the Netherlands we quickly got in touch with the guys to get the service launched here. We thought waiting would probably result in the Netherlands being served last (as usual). After some back and forth we got everything up and running and Amsterdam was the first international city on Foursquare. The rest is history as can be seen in the graph. I had been aware of the fact that our Dutch public broadcaster NOS was going to open up their news using an API. During the run up to this I gave them a couple of pointers concerning what we think are great APIs and must-haves for this kind of thing. Then they launched open.nos.nl to a limited amount of people at first to play around with and see the initial beginnings. It is quite modest right now with three end-points and not a lot of functionality or content to play with, but it’s a solid beginning and it is clearly meant to grow. Busy though we are right now, I got a bit of an itch on Monday and whipped together this simple example: Ons Nieuws which is a glanceable news display of the latest news on NOS.nl meant to replace the tt101 screens that run at pretty much every news/publicity department. Ons Nieuws is heavily influenced among others by: DEXTR. Glanceability and ambiance seems to be getting back in vogue also with apps such as Trickle. This thing we whipped up is really a very simple proof of concept version mainly meant to exercise the API, but it may lead to more serious applications. The first of these cards have made their way out into the public so I think it’s time to show them to the world at large. They are the first step in rolling out the graphic style we have come up with in a collaborative creative process with the awesome graphic designers at Buro Pony in Rotterdam. 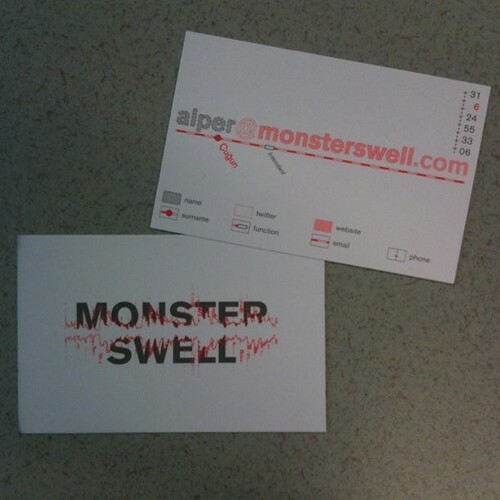 The front of the card bears a logo of which there are two currently consisting of the text Monster Swell in all caps in Akzidenz-Grotesk —a choice font— occluded by a waveform image. That is conceptually consistent and pretty straight forward. It was a lot of fun and productive working with the Ponies and expect a collaboration on their side of the Randstad in 2011. We’re pretty pleased with how the cards turned out and we hope you like them too.